Atop the site of a Cistercian Abbey, this landmark hotel is formed from two old inns (the Castle Inn itself and the 15th century Kings Head). During its time it is said to have played host to William Wordsworth, Queen Victoria, and the industrialist Thomas Telford. 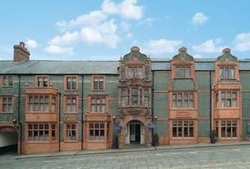 The hotel features its own restaurant, Dawson’s, which specialises in Welsh cuisine. Interestingly, this is named after John Dawson-Watson, the Victorian artist, and some of his work adorns the hotel walls today. Four star rated, The Castle Hotel features 28 guest bedrooms in total, including the Wynn Suite which boasts a beautiful four-poster bed that reputedly dates from 1570. Situated right at the heart of Conwy, the hotel is but a few hundred feet from Edward I’s fortress from which it takes its name. Those traveling by car will find that Llandudno, Colwyn Bay and Anglesey are all just a short journey away. The Castle Hotel accepts dogs (extra charges may apply).